EUR/CHF trades 0.08% higher on the day at 1.1330 at 1150 GMT. 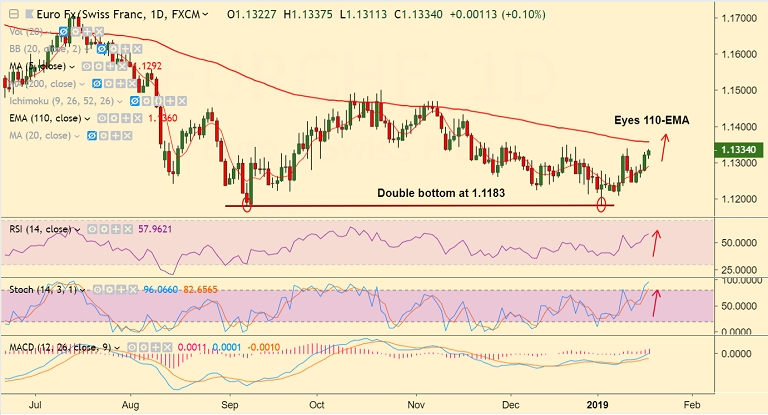 The pair js extending upside after forming a double bottom at 1.1183. Technical studies are bullish, Stochs and RSI are sharply higher. Price action has broken above 55-EMA and is on track to test 110-EMA at 1.1360. Breakout at 110-EMA eyes next major resistance at 1.1433 (Nov 16 high) ahead of 200-DMA at 1.1487. Break below immediate support at 5-DMA could see weakness till double bottom at 1.1183.